About $300 per year for an account with $50,000 in assets. About $925 per year for an account with $50,000 in assets. *Median all-in costs of portfolios under $250,000, from the 2017 Planning Profession Fee Survey. 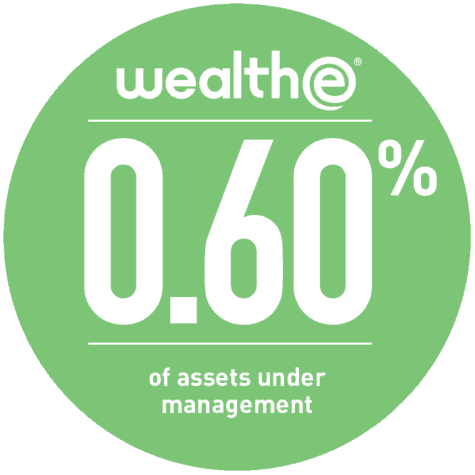 You’ll pay just 0.60% per year for professional investment management (assessed quarterly, conveniently debited from your account). The low fee includes automated rebalancing for accounts over $5,000, plus all trading and dividend reinvestment. With an account of $50,000 or more you can enroll in tax-loss harvesting. Convenience and simplicity with no trading commissions charged. Login via the WealthE website or mobile app for automatic access to statements and performance reports. Ongoing 24/7 account management is digital and easy. WealthE accounts can range from a minimum of $5000 to a maximum of $250,000. Clients with accounts greater than $250,000 should contact a financial advisor at BerkshireMM.com.